A simplified geological map showing the areas covered by the excursions detailed in this guide. 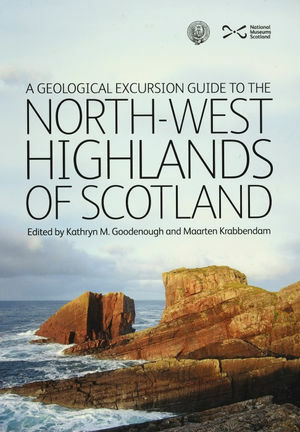 Goodenough, Kathryn M. and Krabbendam, Maartin (Editors) A geological excursion guide to the North-west Highlands of Scotland. Edinburgh : Edinburgh Geological Society in association with NMS Enterprises Limited, 2011. Locality 1.12 [NC 2372 2408] Outcrops of the Salterella Grit Member and Ghrudaidh Formation. Locality 9.1 Track to Ben More Lodge. Locality 14.10 [NC 3903 6872] Balnakeil Formation. Locality 14.13 [NC 3785 7135] Moine Thrust viewpoint. Locality 14.16 [NC 4100 6740] Sangobeg Fault. Work in the North-west Highlands, carried out by British Geological Survey (BGS) staff and collaborators, has been greatly helped by the support of the local people. Particular thanks are due to the staff and volunteers of the North West Highlands Geopark; to the many local landowners who assisted with access for fieldwork; to Scottish Natural Heritage staff in Ullapool; and to Chris Rix and all at Inchnadamph Lodge. The contributors have also benefited greatly from fruitful discussions with many people, too numerous to list here, during field excursions and conferences in the area. The majority of the figures in this excursion guide were drafted by Craig Woodward, BGS Edinburgh. This edition of the excursion guide owes much to Suzanne Miller, who gave us the impetus to start work on a new version of the Assynt guide that had been published in 1979. In the early 1880s, Charles Lapworth’s discovery of the Moine Thrust in North-west Scotland and Marcel Bertrand’s discovery of the Glarus Thrust in the Swiss Alps established thrust tectonics as a fundamental mechanism of crustal shortening in orogenic belts. The subsequent heroic phase of map-ping of the North-west Highlands by the team of British Geological Survey geologists led by Ben Peach and John Horne (the ‘investigator twins’) estab-lished the region as classic, recognised as such around the world, not only for the clear display of the nature of thrust systems but also for the remark-able igneous, metamorphic and sedimentary geology. The Assynt area is famous because it encapsulates many characteristic features of North-west Highland geology and accordingly the Survey team devoted much effort in preparing a special map of it. Obviously, a guide to the Assynt region was an imperative. The first edition (1937) of the Assynt guide was the work of two members of the British Geological Survey: Murray Macgregor, whose work was mainly in the Midland Valley, and James Phemister, who mapped parts of Sutherland. It contained excellent coloured maps. The second edition (1979) was revised and extended by us and retained most of the locality descriptions and the coloured maps but added sketches of the structural phenomena, which are marvellously displayed on moun-tain sides. The timing was appropriate, coinciding as it did with a renewed attack on the problems of the Assynt region in the light of ‘thin-skinned’ thrust tectonics imported from the Appalachians and the Canadian Rockies. New maps of the major igneous intrusions at Borralan and Loch Ailsh were provided. In the preparation of the present edition a large team has been assem-bled to provide up-to-date interpretations of the structural relationships, sedimentology, and metamorphic history. On the igneous front, the rela-tionship between magmatism and thrusting is explored by expanding the discussion to include the minor intrusive rocks and the radiometric ages obtained since 1979. The area covered by the guide now includes the thrust zone between Assynt and Eriboll (Lapworth’s area) and more on the rocks of the foreland, which at the time of writing are the subject of intense study using methods such as zircon chronology. The first two editions provided several generations of professional geologists, students and amateurs with access to the treasures of Assynt. The new expanded edition shows that this classic region continues to yield up its secrets! 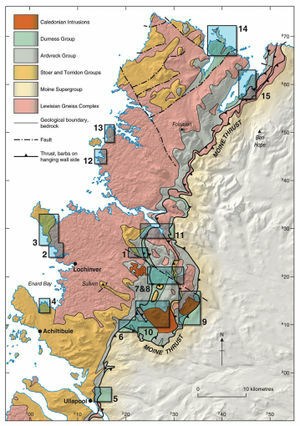 This guide describes the bedrock geology of the North-west Highlands from Ullapool northwards, including many classic localities in the Moine Thrust Zone and its foreland. The area described here also largely corre-sponds to the North West Highlands Geopark. The geology of the Moine Supergroup, lying east of the Moine Thrust, is discussed in a companion guide (A Geological Excursion Guide to the Moine Geology of the Northern Highlands of Scotland, published by the Edinburgh and Glasgow Geolog-ical Societies). The North-west Highlands are also of great interest for their Quaternary geomorphology, which is not discussed in this guide but is described in several other publications. These include Classic Landforms of the Assynt and Coigach Area, published by the Geographical Association, and two excursion guides published by the Quaternary Research Association. This guide has been written for those with some knowledge of geology, whether students, interested amateurs, or professional geologists. Less technical introductions to the geology and landscape of the North-west Highlands are provided by The Northwest Highlands: a Landscape Fashioned by Geology, published by Scottish Natural Heritage; and Exploring the Landscape of Assynt: A Walker’s Guide and Map, published by the British Geological Survey. Access to the North-west Highlands has improved greatly since the earlier editions of this guide were written, with the construction of fast new roads and bridges such as that at Kylesku. Nonetheless, this remains a remote and mountainous area, with some of the most dramatic scenery in the British Isles. The excursions described here vary from roadside stops to challenging, full day mountain walks over extremely rough terrain. The weather in this area can change very rapidly, with sunny mornings giving way to pouring rain by lunchtime – and vice versa. Therefore, all parties following these excursions should be well equipped with warm and waterproof clothing, sturdy walking boots, and topographic maps of the area (a list of relevant maps is given below). From May to September, some form of midge repellent will also be essential. All localities are given with accurate grid references, and so the use of a GPS is recommended. At the time of writing, mobile phone coverage is reasonably good along the main roads and on the mountaintops, but largely non-existent in the more remote glens. Under the Land Reform (Scotland) Act 2003, access to the Scottish countryside is open to all, but these rights bring with them responsibilities. You should always keep dogs under control; leave gates as you find them; never leave litter; avoid damage to the local environment, whether animal, vegetable or mineral; and follow reasonable advice from land managers if management operations are going on. This last point is particularly important in the Northwest Highlands, where deer-stalking can take place from July until February. Stalking is a crucial part of the sustainable management of deer populations and of the economy of this area, and should be respected by all visitors. During the stalking season, if you wish to follow excursions away from the road, please follow all requests made by estate staff, either in person or through signage. If at all possible, the relevant estate should be contacted in advance of the excursion. Estate contact details are not given here, because of the likelihood of these changing during the lifetime of this guide; useful information can be obtained from www.whoownsscotland.org.uk. Many of the localities listed in this guide are Sites of Special Scientific Interest (SSSIs). Where this is the case, it is normally stated in the text. There should be no hammering or in situ sampling of any kind at these localities. If you have a genuine research reason for sample collection, you should first request permission from the local office of Scottish Natural Heritage [www.snh.org.uk]. At sites that are not SSSIs, hammering is allowed, but is rarely needed, since the field relationships are generally very clear. If you really want to collect samples, please consider the other visitors that will come after you; repeated hammering by generations of geologists has already destroyed geological and geomorphological evidence at some localities in this area. Travel to the North-west Highlands is easiest by car; the journey to Ullapool from Inverness takes around one hour, with the total journey from Ullapool northwards to Durness taking a further two hours. The nearest train stations are at Dingwall and Lairg, which are both reached by a small number of trains a day from Inverness. Scheduled buses run from Dingwall and Inverness to Ullapool, and connect with buses to Lochinver. At the time of writing, a postbus from Lairg serves Lochinver and Durness. Access to the majority of the excursions listed here will be difficult without some form of private transport. For larger parties, hired coaches may be useful and will have no problems with the main roads, but some of the localities described here are accessed by single-track roads that are not suitable for large vehicles. The North-west Highlands are quite sparsely inhabited. Limited accommodation is available in a number of the towns and villages within the area of this guide, but booking in advance is always recommended, and indeed is essential in the summer. A choice of hotels, bed & breakfasts, self-catering accommodation and camping can be found in the larger centres of Ullapool, Lochinver and Durness. Individual hotels and/or hostels are situated in the villages of Achiltibuie, Achmelvich, Inchnadamph, Kylesku, Scourie, Rhiconich and Kinlochbervie. The best maps to use for these excursions are the Ordnance Survey 1:50,000 scale Landranger or 1:25,000 scale Explorer maps. The excursions described in this guide lie on Landranger sheets 9 (Cape Wrath); 15 (Loch Assynt); 19 (Gairloch and Ullapool); and 20 (Beinn Dearg and Loch Broom). Ordnance Survey maps are available in a range of outlets across the North-west Highlands. Geological maps are published by the British Geological Survey (BGS), and can be purchased online via www.bgs.ac.uk, at the BGS offices in Edinburgh and Keyworth (Nottingham), or at the Natural History Museum, London. Maps are also available for free viewing from the BGS Maps Portal, this includes the recent Assynt special sheet. An overview of the geology is given by the 1:625,000 scale Bedrock Geology: UK North map. More detailed information is provided by the 1:50,000 sheets, and Excursions 1 and 6–11 lie within the Assynt Special Sheet. The remainder of the excursions are spread across sheets 101E (Ullapool); 101W (Summer Isles); 107E (Loch Glencoul); 107W (Point of Stoer); 113 (Cape Wrath) and 114W (Loch Eriboll). A vast number of papers have been written about the geology of the North-west Highlands over the last 100 years; many of these are referenced in the text, and details are given in the reference list at the back of the guide. A few books are recommended as general background reading. The first two in the list below offer information about the geology of the area and the history of research; both are written from a personal standpoint and do not require extensive geological knowledge to read. The second pair of books provide up-to-date, detailed reviews of the current state of scientific knowledge about the geology of Scotland. OLDROYD, D. R. (1990): The Highlands Controversy: Constructing Geological Knowledge through Fieldwork in Nineteenth-Century Britain (Chicago: University of Chicago Press). RIDER, M. H. (2005): Hutton’s Arse (Rogart: Rider-French Consulting). TREWIN, N. H. (ed.) (2002): The Geology of Scotland (London: The Geological Society). WOODCOCK, N. and STRACHAN, R. A. (eds) (2000): Geological History of Britain and Ireland (Oxford: Blackwell Science). This page was last modified on 23 December 2015, at 19:38.